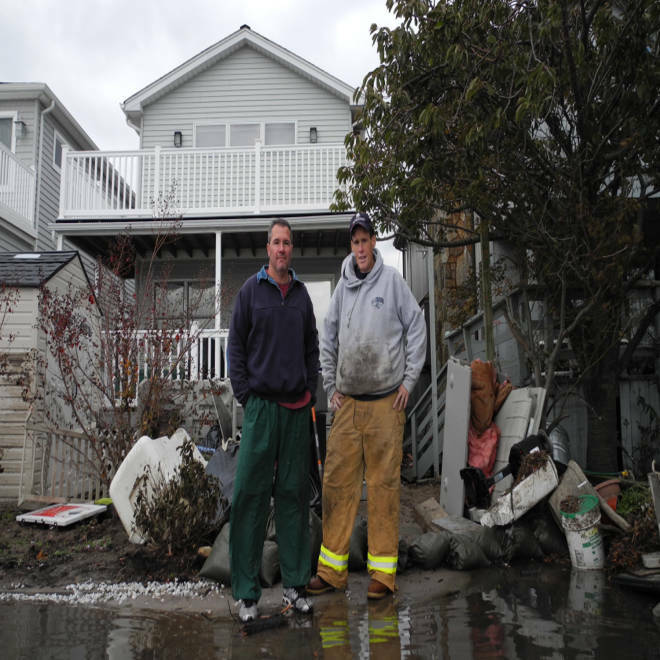 Joe Adinolfi, a firefighter, and John Manning, an EMT, stand in the front of the home of Manning's mother in Breezy Point, N.Y. Her basement was flooded, and the pair said they were concerned about getting the services needed to help with the cleanup as the temperatures chilled. The community lost more than 100 homes to a fire triggered by Hurricane Sandy, and many others were damaged or destroyed by flooding in the storm. BREEZY POINT, N.Y. -- Some residents in Breezy Point, a tiny seaside community in New York inundated by flooding and ravaged by a fire triggered by Hurricane Sandy, questioned Wednesday when help would arrive from the American Red Cross, the National Guard, and the Sanitation Department and other city agencies that would provide key services. While they cleaned their homes of the debris, some worried about rotting food and mold, while others said it would be nice to have a blanket or a hot cup of tea or coffee as the New York weather dipped into the low 50s with chilly gusts off the ocean making it feel even colder. Others asked about getting dumpsters or a temporary cell tower, since a weak signal made it very tough to make calls after the disaster. “Don’t leave us. Don’t leave us,” said John Manning, a 45-year-old EMT with the New York Fire Department. His friend, firefighter Joe Adinolfi, said he had for the first time less than an hour before spotted the Red Cross in Breezy Point, where the fire claimed more than 100 homes. “I understand there's casualties and tragedy everywhere, and I’m sure they are spread out thin,” Manning said. He noted that firefighters and police were assisting the community, and that there were casualties and destruction elsewhere, but he said he had seen workers from city agencies come down to Breezy Point and take photos -- and then leave without helping. As he stood in ankle-high water in the basement of his mother’s flooded house, where streams of pink insulation hung in rows, he said that he was overwhelmed by the cleanup prospect and the disaster that had struck his community. His sister’s house nearby was damaged as was his own, too. NBC's Kerry Sanders takes an aerial look at the Breezy Point community in Queens, New York, which suffered a devastating fire during this week's storm and still has flood waters filling the desolate streets.